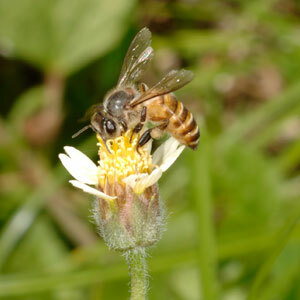 The Asian honey bee, Apis cerana, is the third smallest of the nine species of honey bee and is generally smaller than the European honey bee. The Asian honey bee has a native range throughout Asia. In 2007, an incursion of the Asian honey bee was found in Cairns, Queensland. Attempts to eradicate it have been unsuccessful and it was declared not able to be eradicated in 2011. A containment program has begun to restrict its spread and minimise its impacts across public health, social amenity, the apiary industry, and those industries reliant on bees for pollination services. Asian honey bees can act as individuals or as part of the colony and this trait allows them to be highly flexible when challenged with different environmental conditions. This makes them successful invasive insects. They tend to forage from numerous minor sources of nectar and pollen rather than a major source such as a crop. They are non-specialist in their nest sites with many cavity types used, and they will desert their nests readily in response to a food shortage, attack or disease outbreak. The Department commissioned a review of current scientific literature to determine what is known about the possible impacts of Asian honey bees on the Australian environment. The report considered what we know about the Asian honey bee as a species, their overseas distribution, ecology, and biology. There is also a comparison with what we already know about the European honey bee and the bumble bee and what we can learn about the comparison regarding potential impacts of the Asian honey bee on the Australian environment. The main conclusion of the review was that, as with other feral honey bees, the Asian honey bee may have a negative but unquantified impact on the environment, most likely associated with competition for native fauna for floral resources or nesting sites, inadequate pollination of native flora or undesirable pollination of exotic flora.